On Molecular Genetics and the Origin of the Polar Bear. « Nothing in Biology Makes Sense! On Molecular Genetics and the Origin of the Polar Bear. Understanding the history of species is critical to understanding evolutionary processes and for making predictions about how biodiversity will fare in a rapidly changing climate. Information about how species are related (phylogeny) and how their populations have responded to past climate change (historical demography) can inform us about the conditions under which they have evolved and adapted, and how they might respond to changes currently under way. Modern scientists get at these questions by examining two types of data: the fossil record and patterns of DNA sequence variation. The fossil record is relatively straightforward. You find a fossil in location X. You identify it as species Y and you use some method to (e.g. radiocarbon dating) to infer it was there at time Z. Making inferences from DNA sequence variation, by contrast, involves complex, computer-intensive statistical analyses, and the field is in a state of tumultuous, rapid advance. 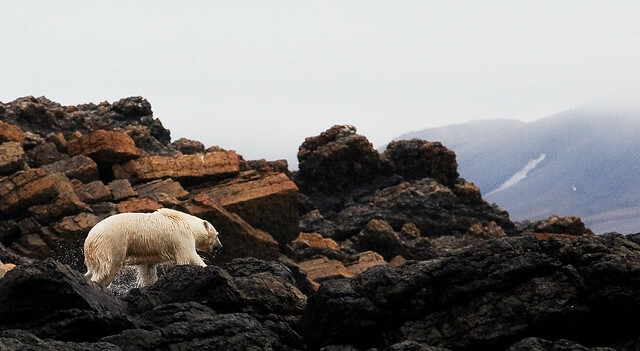 A fascinating case study that involves the integration of fossils and DNA sequence data, and illustrates the ways in which rapid statistical advances are changing our understanding of species’ evolutionary histories is that of the origin of the polar bear (Ursus maritimus). For decades, it has been thought that polar bears arose relatively recently (50-150 thousand years ago) from brown bears (Ursus arctos) and rapidly specialized to forage on polar ice. Kurtén (1964) believed they were derived from Siberian brown bear populations. This was originally informed by the fossil record, with older polar bear fossils having never been found. With the advent of accessible DNA sequencing technology, researchers confirmed the hypothetical relationship of polar and brown bears as sister species and further found that the polar bear lineage actually seemed to be nested within brown bear lineages, with polar bears being most closely related to brown bears from the Admiralty, Baranof and Chichagof islands in southeast Alaska (Talbot and Shields 1996). Although the hypothesis of a Siberian origin appeared to be rejected, the statistics of the day did not allow for a rigorous estimate of timing from molecular data. For a variety of technical reasons, studies in the early days of molecular genetics used primarily mitochondrial DNA (mtDNA) for historical inference. MtDNA has a few quirks that differentiate it from the rest of the genome: it is maternally inherited and it does not recombine. These quirks have an important consequence for studies based on it: the whole mitochondrial genome has a single story to tell, and that story is matrilineal. You can see how this limitation might play out in phylogenetic inference if you consider attempting to use mtDNA to trace a person’s ancestry. Take me, for example. Of my eight great-grandparents, seven of them are irish, but my mother’s mother’s mother is German. As a consequence, 7/8 of my genome is expected to be of Irish origin, and the other 1/8 (plus mtDNA) Germanic. Given a sufficient database for comparison, if we sequenced a random set of genes from throughout my genome, we would discover this. If we only sequenced mtDNA, however, we would only see my German ancestry. As we sequenced more and more mtDNA, we would become more certain that I was of German descent, and be able to identify with greater precision which state and perhaps which town my great^5-grandmother hailed from. What we would not see, however, is that 7/8ths of the freely recombining, bi-parentally inherited genes contributed to my nuclear genome by my numerous non-maternal ancestors would tell a multitude of other stories, each of them tracing their own ancestries back to the Emerald Isle. This limitation of relying on a single genetic locus (in this case mtDNA) remains important when inferring the histories of whole species on the scale of thousands to hundreds of thousands of generations, and in the late 1990’s and early 2000’s, researchers started to become aware of this fact. In spite of this knowledge, laboratory and analytical obstacles remained that prevented researchers from gathering and appropriately analyzing DNA sequence from many nuclear genes. Meanwhile, analytical developments began to occur that allowed the use of dated fossils in combination with DNA sequences to estimate the timing of branching events in phylogenetic trees and technical advances allowed DNA to be extracted and sequenced from “sub-fossil” remains over 100 thousand years old. In light of these challenges and developments, researchers doubled down on mtDNA sequencing. They gathered full mitochondrial genomes from extant bear populations as well as fossils and used sophisticated time-calibrated analyses to hone in precisely on date that polar bears diverged from their brown bear ancestors. In perhaps the pinnacle of this work, Lindqvist et al. (2010) sequenced the mitochondrial genome of a 130-110 thousand year old polar bear jawbone and used that information to infer that polar bears diverged from the brown bears of southeast Alaska 152 thousand years ago. Because the fossil that supplied the ancient DNA shared modern polar bear morphology, the work suggested that after the split, the polar bear lineage underwent a spectacularly rapid evolutionary change, adapting morphologically and physiologically and expanding across the arctic region in 20-30 thousand years to become the polar bears we know today. From 2008 to 2010, a series of algorithms were published that could take data from multiple genes and infer the history of whole populations, a drastic improvement over previous methods that could only identify the history of single genes (e.g. mtDNA). 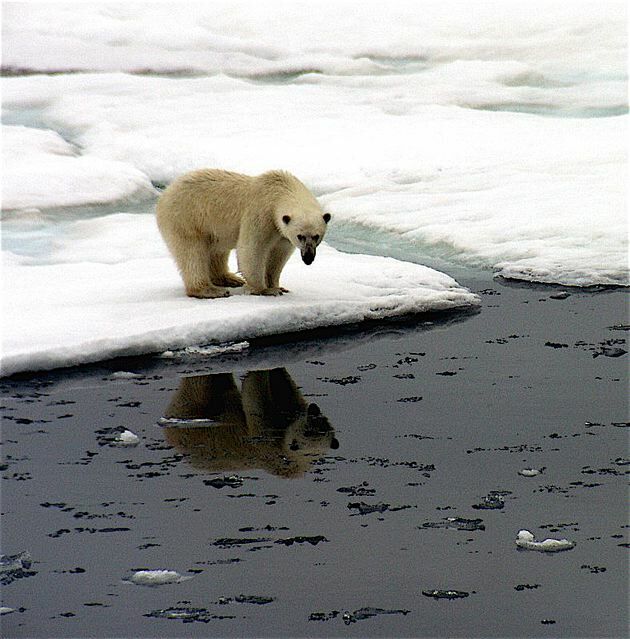 With these methods in mind, a group of researchers gathered data from 14 nuclear genes for multiple extant brown and polar bear populations (Hailer 2012). When they analyzed these data they found them to be inconsistent with mtDNA in both the branching pattern and the timing of branching. 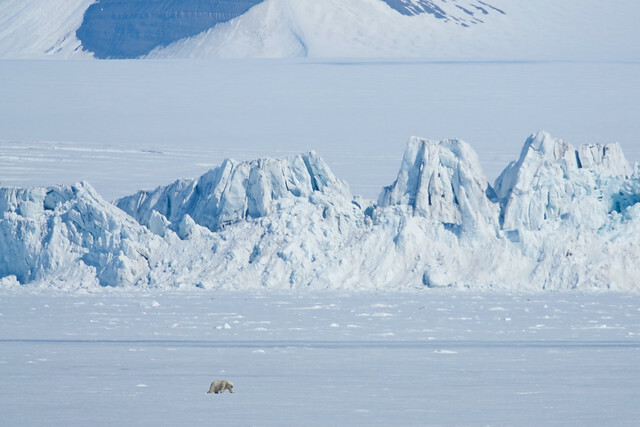 That is to say, the new data analyzed with the new method suggested that polar bears diverged far earlier than previously thought (around 600 thousand years ago) and that they were no longer closely related to the southeast Alaska population, but rather to the common ancestor of all brown bear populations. The authors posit that the most likely explanation for the drastic incongruence between genes is introgressive hybridization. It is likely that some time in the last 100 thousand years, polar bears hybridized with brown bears, and that brown bear mitochondrial DNA spread throughout polar bear populations and became fixed. This new information changes the interpretation of polar bear evolution in three important ways. First, the older origin of Ursus maritimus obviates the need to invoke extremely rapid evolution to explain the appearance of the remarkably well adapted polar bear. Second, it means that polar bears have persisted throughout many pleistocene glacial cycles, implying that they have been historically resilient to drastic changes in the polar environment. Finally it has been hypothesized that large scale mitochondrial introgression can result from drastic demographic processes, such as rapid expansion of restricted populations. In the case of polar bears, this implies that they may have been subject to drastic range contractions and expansions in the past. Given the winding path technology and statistics have taken us on toward understanding the evolution of polar bears, and the current pace of innovation, we can only assume that the parts of the story we know now are still incomplete, and in ways that we may not yet understand. In the future, we can expect to learn in greater detail about demographic changes, such as the timing and extent of aforementioned population size shifts, and perhaps more importantly about how polar bears have adapted to climate change in the past, and how they might in the future. Hailer, F., V. E. Kutschera, et al. (2012). “Nuclear Genomic Sequences Reveal that Polar Bears Are an Old and Distinct Bear Lineage.” Science 336(6079): 344-347. Lindqvist, C., S. C. Schuster, et al. (2010). “Complete mitochondrial genome of a Pleistocene jawbone unveils the origin of polar bear.” Proceedings of the National Academy of Sciences. Talbot, S. L. and G. F. Shields (1996). “A Phylogeny of the Bears (Ursidae) Inferred from Complete Sequences of Three Mitochondrial Genes.” Molecular Phylogenetics and Evolution 5(3): 567-575. This entry was posted in phylogenetics and tagged molecular biology, phylogenetics, polar bear, Ursus maritimus. I am awestruck by this article. I actually friggin’ think I understood the 150k mtDNA hybridisation bit. And the bit about rapid evolution not necessarily being needed to explain polar bear adaptation. Hyperinteresting read. << Came from Pharyngula Carnival of evolution.